"You're killing me, Duffy. You're killing me," the mom always said. Murdering the Mom is a story that elevates the obscene to the sublime. Duff Brenna takes all the materials of hardship and abuse during an unhappy childhood and sculpts it into art, into something transcendent. This is a heart-rending memoir that exceeds the expectations one normally has of a memoir, that is, it reads like a captivating novel. "Brenna's experience is all there, in thorough, felt detail--in the embedded dialogue, in the scenes truer than memory or invention, in the visionary understanding of grotesque and sympathetic characters, and in the complete, self-standing episodes woven into the chronological flow. Anyone following the landmark achievements of literary memoir must learn from and celebrate this remarkable book." "There are some memoirs that seem so artful in the dissection of the joys and horrors of a life that they resonate long after that last page. Duff Brenna provides just such a story...[he] provides a compelling attempt to untangle the emotional threads of his childhood. By viewing his past with such a sense of honesty and compassion, he delivers a memoir that's a truly striking accomplishment." SAN DIEGO LIVING'S INTERVIEW WITH DUFF BRENNA. 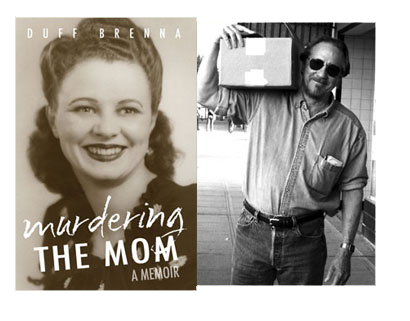 "Duff Brenna is one of the most talented, brave and daring writers of contemporary American letters...With great skill, insight, wisdom, introspection, and above all a sense of humanity and forgiveness, a brilliant writer transcends the tragic and turns this powerful, raw, heartfelt story into the finest art." "This book portrays a broken childhood and a struggling life in the most raw and honest manner imaginable. He makes this book a personal gift to every reader." "[Duff Brenna] is exploring--unsparingly, unflinchingly, but above all fairly, with balance and breathtaking honesty--the humanity of a group of people born into and continually creating a kind of hell in which they thrash around without a clue as to how to get out." "With plenty of humor and poignancy, Murdering the Mom, is an excellent pick for memoir collections, very highly recommended." "Duff Brenna childhood and coming of age are as harrowing as Maxim Gorki's, but where Gorki's calls for a Soviet revolution to free underlcasses from the cycle of brutality, Brenna's celebrates our common humanity, complexity, and resilience, revolution within. His accounts of being brutalized and loved by his stepfatherare both horrific and comic. This is a memoir remarkable for its ironic acceptance of outrages..."
"Murdering the Mom is wonderful! I just finished it a minute ago. A delicious read...those last scenes are terribly moving." DUFF BRENNA is the author of six novels, including The Book of Mamie, which won the AWP Award for Best Novel; The Holy Book of the Beard, named "an underground classic" by The New York Times; Too Cool, a New York TimesNoteworthy Book; The Altar of the Body, given the Editors Prize Favorite Book of the Year Award, South Florido Sun-Sentinel, and also received a San Diego Writers Association Award for Best Novel in 2002. He is the recipient of a National Endowment for the Arts award, Milwaukee Magazine's Best Short Story of the Year Award, and a Pushcart Prize Honorable Mention. His work has been translated into six languages. His collection of short stories, Minnesota Memoirs, was published by Serving House Books in February, 2012.